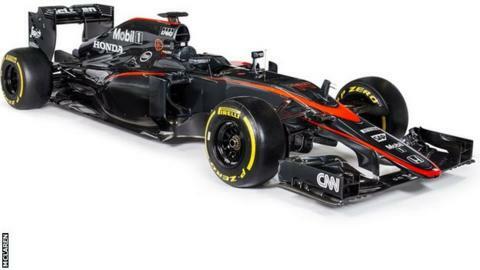 McLaren have unveiled the first fundamentally new colour scheme on their Formula 1 car for 18 years. The team have ditched the predominantly silver livery they have sported since 1997 in favour of graphite grey, with day-glo orange highlights. It is only the second major change of colour scheme for the team since 1974. A spokesman described the new design as "a dynamic, predatory graphite-grey colouration, complemented by McLaren day-glow 'speedmarks' and key lines". He added that the idea was to "optimise (the car) not only for bright sunshine but also for floodlights used in twilight and night races". The livery will make its first appearance at this weekend's Spanish Grand Prix. The team hope for a step forward in performance at the Circuit De Barcelona-Catalunya, following a troubled start to the season in which they have begun a new engine partnership with Honda. McLaren have failed to score any points so far and have only once managed to get a car through the first knock-out part of qualifying. The team have upgrades on both chassis and engine for this weekend's race. Racing director Eric Boullier said: "We know that one fix or upgrade won't provide a significant upturn in performance, so we're united in our continued efforts to bring further gains to both chassis and power unit, in terms of both reliability and outright performance, step by step."